Westmoreland Cleanways operates a FREE ClearStream Recyclers Loaner Program for use at public events in Westmoreland County, such as Greensburg’s SummerSounds, Westmoreland Arts & Heritage Festival, Latrobe Relay for Life, Scottdale Fall Festival, and the Latrobe-Derry Teener League. These bins can also be borrowed for use at private parties such as outdoor weddings, family reunions and graduation parties. ClearStreams are easy to set up and service. Lids snap securely onto the frame at four points. A patented baglock system, secures the bag to the frame. The 45 gallon clear bags, are printed with set up instructions, and are easily emptied without vertical lifting, reducing the risk of back injuries. The clear bags allow staff to see from a distance when a bin needs servicing, preventing overflows and helping security to monitor the contents of the container. Participants may borrow as many containers and bags as needed for use at the event. Recyclers are loaned on a first come-first served basis. Call the office at 724-879-4020 or email our Program Director to check on bin availability and to make a reservation. Complete the Borrower’s Agreement prior to bin pick up. Pick up and return loaner bins from Westmoreland Cleanways Recycling Center, 113 Innovative Lane (Building F), Latrobe, PA 15650-5462. Report the number of bags of recyclables collected at the event. Recycle the material: 1) hire a private hauler to collect the recycling; or, 2) self-haul recyclables to a drop-off or processing center. Westmoreland Cleanways and Recycling can offer assistance but cannot guarantee arrangements. Reimburse Westmoreland Cleanways and Recycling for the replacement cost of the loaner bin should container be damaged or not returned. Replacement costs can be found on the Borrower’s Agreement form. Special Events Recycling is planning for and implementing a system to collect recyclable material at special events and other public venues. It sounds easy, but a truly successful program takes some thought and consideration for those unforeseen “what ifs”. 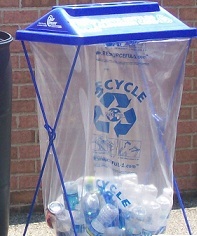 Recyclables typically include beverage containers, plastic, glass, or aluminum cans. But, special events recycling can be so much more. Vendors potentially generate lots of corrugated cardboard; food vendors generate cans and bottles from condiments; conference attendees may generate a lot of paper. Pre-Event Planning: Designate an event coordinator or team; discuss what materials can be recycled locally; barriers to recycling; opportunities for waste reduction. Workers: Vendor, Volunteers or Employees? Special Event Recycling can be very labor-intensive unless everyone has a role and buys into it. Make sure everyone knows what is expected. Logistics: What will be collected? What kind of containers will be use? Who will place the containers and empty them? Where will the recyclables be stored? Who will take them to the recycling center or drop-off? A poorly planned effort that does not result in a significant amount of recyclables being diverted from the waste stream can be discouraging and result in an “I tried it once but it didn’t work” attitude. A well-thought out plan that makes expectations clear to all can result in a significant portion of waste being recycled and everyone feeling like they were a part of the success of the program. Download the EPA brochure It’s Easy Being Green! A Guide to Planning and Conducting Environmentally Aware Meetings and Events. Contact Westmoreland Cleanways and Recycling for assistance in developing a Special Event Recycling Plan.